ITT Corporation announces the introduction of the first of the ebro EBI 40 multi-channel data loggers from ITT Analytics. 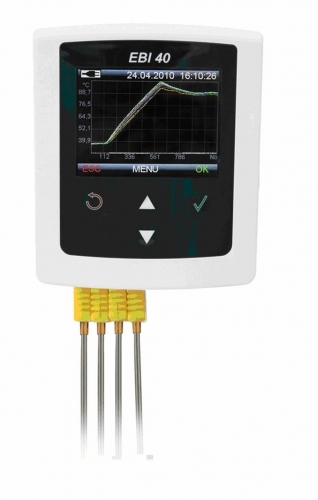 The 12-channel thermocouple data logger is for thermal mapping in food, industrial, pharmaceutical and general lab applications, offering simple and high-accuracy measurement over wide temperature ranges. productivity and performance, resulting in significant cost savings and increased product output. The EBI 40 data logger offers the flexibility of a wide temperature measurement range, from -200°C to 1200°C. Measurement intervals are also operator programmable from 0.1 second to 24 hours. The system is capable of storing up to 240,000 values per channel, while its large color display allows users to inspect measurement values continuously. In addition to standard programming and data retrieval by the software, the USB connection enables these functions to be facilitated via USB stick offering greater flexibility for field applications.